When summer comes along outdoor parties become frequent events throughout the warmer months and what better way to enjoy the company of friends and family than out in the fresh air. Whether you’re hosting a barbeque, garden party, picnic party or just an outdoors soirée here are some essential tips on how to host the perfect outdoor party. Before deciding on a date for your outdoor party do a little weather research to ensure that your party doesn’t land on a day of unexpected summer showers. The weather can be unpredictable especially here in the UK and organising a back up idea for your party just in case the weather turns bad is always a sensible idea. For instance, it may be worth investing in outdoor canopies as a defence against sudden showers that could potentially ruin your party. Decide on a theme for your party. It is no good advertising your party as a barbeque only to end up serving a buffet. The theme should not change and should be the main focus point of the party. Everything else should be worked around the theme to give guests an idea of what to expect and what to bring. Make sure the theme is carried out and properly explained as an outdoor cocktail party could easily be ruined if everyone turns up with bottles of wine and all you have is a bottle of rum. 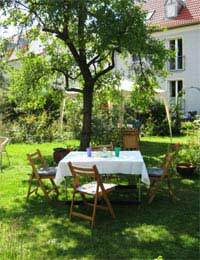 Deciding on the food for your outdoor party is fairly simple and depends on the theme of your party. A barbeque will of course serve grilled/barbequed foods, while an outdoor picnic party will offer a more buffet style selection of foods. Once you have decided on the theme of your party the food should compliment the event while offering enough of a selection for all guests. For example, ensure you have a vegetarian option at any party otherwise some guests may feel left out and slightly offended. When hosting a barbeque make sure vegetarian guests are aware of the vegetarian menu otherwise they may not attend if they feel the only food being served is meat. So, cover all areas to avoid disappointment and confusion. Once the outdoor venue has been established and the theme and food have been chosen it is now time to prepare the area and get everything set up for your guests. Preparation is vital for any outdoor party as there is a lot more to organise outdoors than inside. Those amenities you take for granted in your home have to be taken and arranged outside, so make a list of what you are going to need. If you are hosting a party away from your home ensure you over estimate everything, such as food, drink, plates, cutlery etc, as having too much is better than not having enough. You don’t want your guests standing around for hours waiting for food and drink so ensure you set up the party long before it starts. For example, if you are hosting a barbeque and only start lighting the barbeque after the guests have arrived it may mean they are waiting sometime for the food to be ready. Try to have food ready roughly an hour after guests arrive – this way guests can mingle and have a drink before sitting down to eat. The outdoor party requires a little more organising and thought than a regular indoor party, so make sure you consider all scenario’s before setting up in the great outdoors.